Singer, songwriter, pastor and Stellar and Dove Award nominee Alvin Darling was born December 23, 1948, in Newark, New Jersey, and raised by his grandmother, Lilla Darling. Lilla made sure to take her grandson with her on Sundays to Smith Memorial Church of God in Christ. Alvin was first exposed to gospel music there, and also through listening to his uncles’ locally popular gospel group, the Darling Brothers. The Alvin Darling Ensemble’s first recording was 1977’s A Touch of His Love, distributed by Richburg Records. It was followed by All Together for One, released in 1978 on the Inspirational Sounds label. A sonic departure from Darling’s quartet years, the ensemble blended robust choral singing with funky bass lines, disco beats and sometimes even a flute. The following year, Darling entered the ministry as associate minister at Greater Mt. Zion Holy Church in nearby Cranford, New Jersey, for Bishop Charlie W. Bullock. He became Mt. Zion’s lead pastor in 2001. The Alvin Darling Ensemble signed with Savoy Records and released Expect a Miracle in 1981 and I’ve Learned to Put My Trust in God in 1983. Like their predecessors, these albums articulated the sacred through penetrating choral singing and a deep groove disco accompaniment. Darling’s interest in the Caravans resulted in his writing songs for three of the group’s most famous members: Shirley Caesar, Dorothy Norwood and Albertina Walker. The Alvin Darling Ensemble even sang with Norwood on her 1983 album, Somebody Here Needs a Blessing. It was one of many Darling-Norwood collaborations recorded over the years. Further, He’s All Over Me, a Darling song originally recorded by Bishop Jeff Banks and the Revival Temple Mass Choir, was performed by Caesar and the Georgia Mass Choir in the major motion picture The Preacher’s Wife. 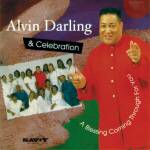 Darling later formed another gospel group, Alvin Darling & Celebration. It was with Celebration that he got his first real taste of chart success. The group’s live album, Medley of Praise (I AM, 1992), landed on the Billboard Top Gospel Albums chart. The project was packed with guest artists, notably the Gospel Music Workshop of America North New Jersey Chapter Choir, the Voices of Faith and the Sounds of Serenity. 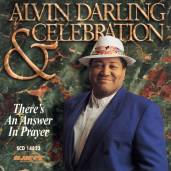 Darling & Celebration rejoined forces with Savoy for There’s An Answer in Prayer (1995) and Blessing Coming Through for You (1998). In the mid-2000s, Darling moved to Troy and Emily Sneed’s Emtro Records, where singles such as All Night and Nobody but the Lord and the album My Blessing Is on the Way landed on the Billboard charts. Waiting Right Here (2013) found the singer-songwriter returning to his Pentecostal church roots and quartet singing days.